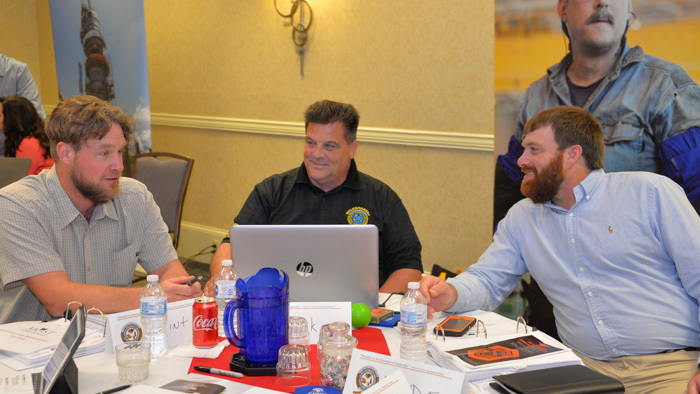 New BM-STs exchange ideas during a training session. From left: Clinton Penny, L-11; Kirk Cooper, L-60 and Wade Mason, L-110. IVP-NE John Fultz, left, and ED-QCCUS Gene Forkin field a tough question. Business managers and staff participate in the new business manager training, conducted by CSO. Construction Sector Operations hosted the training. 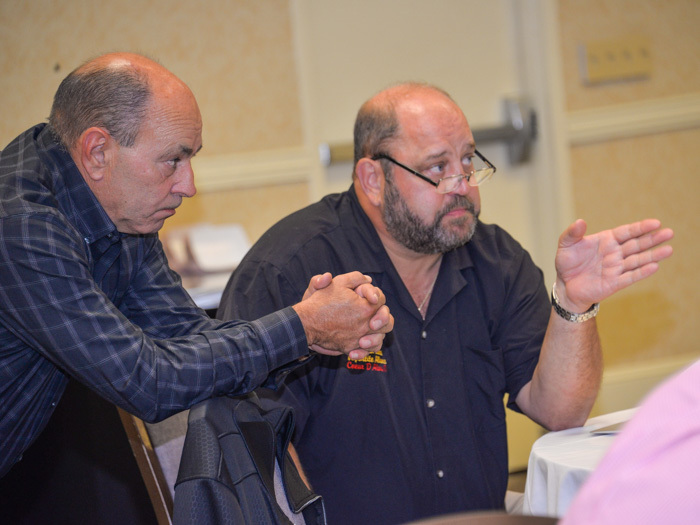 It included four days of instruction on topics including craft jurisdiction, membership and financial reporting, grievance handling and fair representation, national funds, referral rules, safety and health, political and legislative affairs, NACBE and Common Arc, communications, and recruiting. ED-CSO Mark Vandiver and DJS-CSO Marty Stanton coordinated the event and led some of the sessions. Other staff members also participated along with representatives of affiliated Boilermaker organizations. Attending the training were William Bailey, Local 5 Zone 197 (Albany, New York); Johnathon Bates, Local 26 (Savannah, Georgia); Matthew Champion, Local 108 (Birmingham, Alabama); Kirk Cooper, Local 60 (Peoria, Illinois); Eric Davis, Local 1 (Chicago); Louis Dodson, Local 4 (Page, Arizona); James Dukes, Local 456 (Rock Hill, South Carolina); John Hughes, Local 154 (Pittsburgh); Brian Hussell, Local 667 (Charleston, West Virginia); Wade Mason, Local 110 (Hattiesburg, Mississippi); Martin Mahon, Local 744 (Cleveland, Ohio); Chris O’Neill, Local 237 (Hartford, Connecticut); Clinton Penny, Local 11 (Helena, Montana); Gregory Peterson, L-5 Zone 175 (Oswego, New York); Dan Sulivan, Local 374 (Hammond, Indiana); Danny Watson, Local 45 (Richmond, Virginia) and Martin Williams, Local 13 (Philadelphia).